“Pattern” addresses the link between ’60s abstraction and its present-day descendants by placing a 1967 work at the show’s center. It’s “Fold Latitude,” by Thomas Downing, one of the Washington Color School’s lesser-known members. 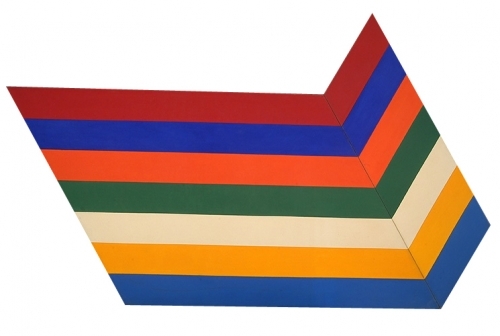 The painting, which bends broad stripes of bold color on a shaped canvas, is an off-kilter variation on the “Chevron” paintings of the artist’s more-celebrated contemporary, Kenneth Noland. Downing, who died in 1985, didn’t wander far into uncharted territory. Green was once known for his black-and-white paintings, and he’s still making them — but now with color. These three canvases are covered with black forms that suggest hieroglyphics, arranged neatly in rows as if in some sort of text. If you look closely, you’ll see that each one is outlined in white (that is, by unpainted canvas.) But the areas between the symbols are filled with lightly brushed-on paint in a single (and bright) hue. “So Be It” is mostly red, “About” is primarily blue and the title of “In Green” is accurate. Lu’s “One Hundred Years of Solitude” paintings come closer to the Washington Color School model. They’re circular, with narrow bands framing large fields. The format is akin to Noland’s “Target” paintings, but Lu’s work is glossier and hotter, with day-glo hues. Four of these canvases, grouped together, use an identical strategy, leaving the main expanse of color at the center. Separated from the others, “One Hundred Years of Solitude, No. 9” illustrates how a small shift in a minimalist composition can have a dramatic effect: It positions its circles in the middle of the picture, defining a large color field both at the center (red) and around the outside (fuchsia). Then there’s the one Lu painting that would have been, at the time of “Fold Latitude,” heretical. Although highly stylized and lacking any illusion of depth, “Theandric Idol” clearly shows a face. It’s not about the ineluctable flatness of the surface. Green’s and Lu’s works share much with Downing’s. All use large expanses of color, thinly applied to display the texture of the canvas. But the younger artists reintroduce something of what was so zealously stripped away during the previous century. If that’s a perversion of modernism’s idealized forms — well, purity can get boring after a while.